Welcome to the official Medieval Europe Wiki, the comprehensive reference written and maintained by Medieval Europe Staff. 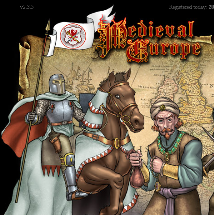 Medieval Europe is a browser game that requires no download. In this game you will enjoy a unique adventure and experience life in the European Dark Ages where conflict was rife, and the Pope and Church was very powerful and highly influential. Are you ready to immerse yourself in this alluring world and choose your calling? You have the option to become an enterprising merchant, or a courageous commander, or a far-sighted governor, or whatever you choose for you are the architect of your own destiny. Travel to Europe in search of glory on the battlefields or devise dangerous plots in the diplomatic world in court; transport your precious merchandise to new and flourishing markets and increment your wealth. Troops of mercenaries are ready to serve those who they can benefit most from. If you manage to accumulate enough possessions, become the owner of a significant and extensive estate, and serve thy Master, you might eventually be rewarded with a noble title. You can help us by translating the game and gain some Doubloons. Where can I do some tests? If you want to test pages, please use the Sandbox page. If you want to help, please check the TODO LIST. This page was last modified on 19 September 2018, at 14:21. This page has been accessed 493,267 times.